“They” did a study!.. But where did they publish it? Most people don’t read original research articles…why would they? They might have an access fee or be too technical to comprehend for the normal lay person. Yet many websites report on results of those “recent studies”. I’ve seen many health websites sensationalize new super important work in peer reviewed journals.. just to realize that the journal it’s published in is rather suspicious. Recent example: one anti-vaccine website posted a list of studies that apparently showed the danger of vaccinating. I wanted to read the very first article on that list and the website provided a PDF. I found myself thinking the results were a bit too extraordinary [see infographic towards the end of this post for HINTS on spotting a suspicious article] … I noticed it was published by some asian journal with a strange-looking website. I proceeded to search for this same article on Google Scholar and guess what? it did not exist there. That’s just fishy. Certain journals have big names and high reputations and are easily recognized (especially by academics). I read a lot of fantastic research articles in Appetite, for example, on the psychology of eating. So we as a research community generally “know” what kinds of journals publish high quality science. YET, even researchers have to be careful to avoid trashy journals that have no standing in the scientific community. What is a “bad” journal: one that publishes low quality work, basically; something that a high reputation journal with scientific standards would not consider publishing. Bad journals often publish anything for a fee, and while they state they are “peer reviewed”, nobody really does any good reviewing, if any (I even saw a case where one of the lister reviewers was a diseased academic). The peer review process is supposed to ensure that your work actually uses real data, appropriate methods, sound conclusions based on the results, etc. It’s supposed to protect us from reading and taking into consideration fake, unscientific, biased work. Who publishes in these trashy journals? It can be young academics who are just trying to publish their research and get duped to pay a lot of money to one of these predatory journals. It can also be bad researchers with bad studies who could never get their trashy work into a good peer-reviewed journal in the first place (yet they can pay to publish, pay to announce this publication, and watch the internet sensationalize their misleading work). One way to know a journal is high quality is to know the publisher is high quality (some famous ones are Elsevier, Springer). Also, some websites post a list of journals (as well as list of publishers) to avoid. Check out THIS BLOG. 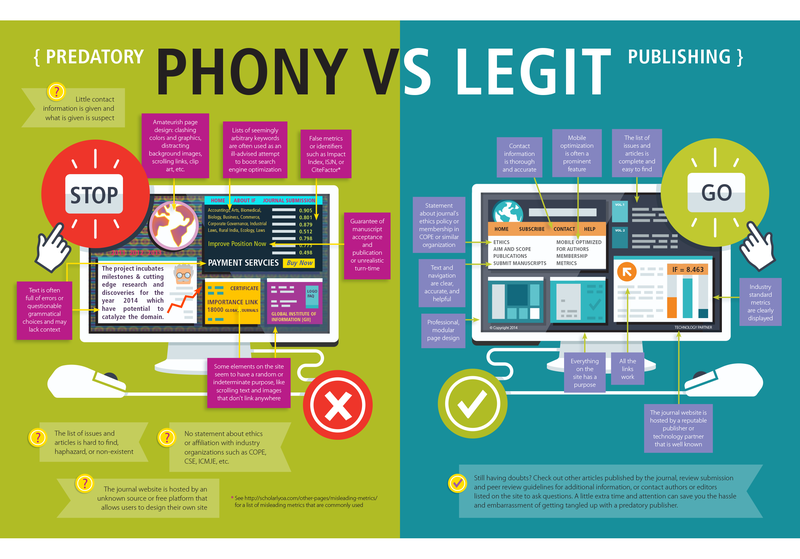 Both academics and public alike can be fooled by low quality journals- they often have legitimate-sounding titles, resembling prestigious journal titles; they have professional-looking websites, etc. Great guide to spotting poor-quality journals! Lastly, while a lot of bad research can be published in bad journals..some poor research can get published in decent ones. A poor study, though, will eventually be retracted. Please follow RETRACTION WATCH to be up-to-date with such work! Otherwise, you could be falsely spreading information about research that was low quality in the first place (e.g. good example is the Seralini rat study on GMO feed (read more here).